British Columbia has an abundance of freshwater. Each section of the province has its own mighty river system, with waters tumbling from icy glaciers on high mountain tops, babbling its way through the creeks and brooks of the British Columbian countryside, until it joins with the world-famous rivers of the Fraser or the Thompson, the Simalkeen or the Shuswap, the Skeena or the Kechinka or hundreds of other rivers rushing their way to the Pacific Ocean. 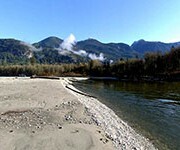 If you are looking for recreational property with riverfront access, then NIHO has the perfect property for you.The rivers of British Columbia provide hours of recreational opportunities for you to enjoy the best of BC wilderness. If you are interested in battling salmon, steelhead or Dolly Varden, take up your fishing rod and head out to any of our riverfront acreages. If you want to set sail in your boat, canoe, or kayak, the rivers running along our properties will allow you to explore our beautiful province in depth. 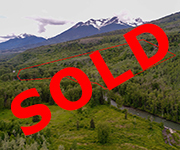 Or, if you wish to sit back and admire the scenery along the riverfront, you may find yourself gazing at countless elk, moose, deer, and other animals who may come to the riverside for a drink, or in some cases, to catch fish for their dinner!And consider this- when you build your perfect vacation home beside one of our rivers, you will not have to worry about fresh water to your property. It’ll be available year round. 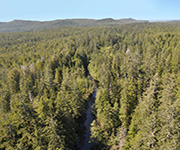 Located within Cape Scott Provincial Park, this 40 acre property is bisected by the Fisherman River. Mostly covered in old growth timber, there are ample opportunities to fish, and Cape Scott Provincial Park is ideal for camping and hiking. We consider this property an excellent investment. 40 acres – square in shape. 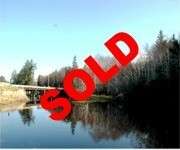 This prime ocean view and river front lot has approximately 242 meters (794 feet) of river frontage on the Chown River. 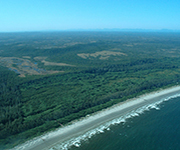 The parkland lot has a small knoll near the northwest part of the property offering an beautiful view of convergence of the Sangan and Chown Rivers, as well as the rolling sand dunes of South Beach. It has partially paved access, and power and phone are available. Public access to the beach is only minutes away, and on a clear day you can see Alaska. 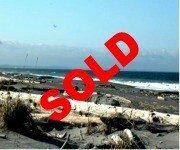 This ocean view and riverfront lot has approximately 195 meters (640 feet) of river frontage on the Chown River. 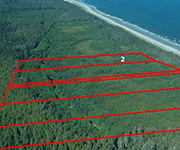 This parkland lot has a knoll on the northeast boundary giving an incredible view of both the ocean and the convergence of the Sangan and Chown Rivers. 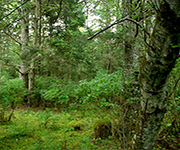 The remainder of the lot is fairly flat, treed in alder and spruce. On a clear day Alaska can be seen in the distance. Power and phone are available, and the lot has partially paved road frontage on Tow Hill Road. This riverfront lot has approx. 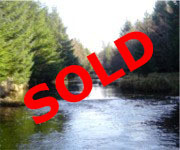 180 meters (591 feet) of river frontage on the Chown River. 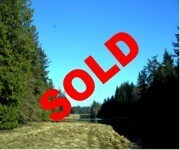 Located inside Naikoon Park, the lot is fairly flat and treed in alder and spruce, with power and phone available. The north boundary of the property is the partially paved Tow Hill Road which is the main access into the Park. Public access to the wide open dunes and flats of South Beach is just minutes away.